The embarrassing saga of Ghulam Nabi Fai, the Pakistani-American who admitted being a paid agent of ISI to promote Pakistan’s official position on Kashmir in the American capital, is well known. It turns out that he may not be alone. The same year Ghulam Nabi Fai was arrested, The New York Times reported that ISI was carrying out a campaign to intimidate Pakistani-Americans. Another report by New York Times found that some US Think Tanks are being secretly funded by foreign governments. Most of the money comes from countries in Europe, the Middle East and elsewhere in Asia, particularly the oil-producing nations of the United Arab Emirates, Qatar and Norway, and takes many forms…Some scholars say the donations have led to implicit agreements that the research groups would refrain from criticizing the donor governments. Pakistan is not mentioned by name in the report, but the prevalence of influential Pakistan-related programmes at foreign think tanks such as the Atlantic Council and Chatham House and the exposure of ISI funded operations in America obviously raise the question who is funding these programmes and their experts. There is also the issue of recent comments by Sartaj Aziz, PM’s Advisor on Foreign Affairs, who said that Pakistan would no longer hire professional lobbyists to represent Pakistan’s interests, but would use overseas Pakistanis to influence the US government instead. Overseas Pakistanis have an important role to play in teaching foreigners about the reality of Pakistan, but as was demonstrated in the Ghulam Nabi Fai fiasco, this can also be manipulated by vested interests. The mysterious ‘foreign hand’ is a favourite bogey of conspiracy theorists and disinformation agents, but people like Raymond Davis and Ghulam Nabi Fai prove that foreign hands can and do exist. If overseas Pakistanis are going to speak for us, we deserve to know whose agenda they are promoting. 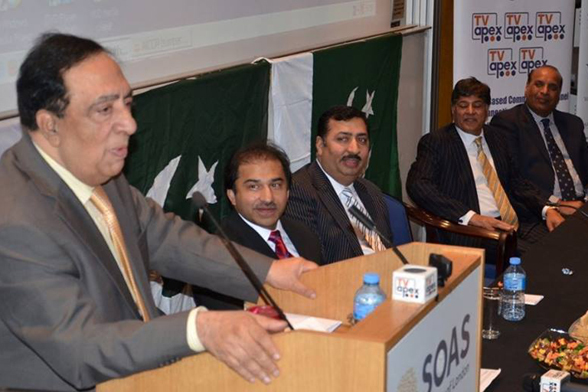 In the case of the so-called ‘World Congress of Overseas Pakistanis,’ they are certainly not promoting mine. This entry was posted in Blogs and tagged Atlantic Council, Chatham House, foreign agents, ghulam nabi fai, Hamid Mir, isi, malala, malala yousafzai, Raymond Davis, World Congress of Overseas Pakistanis by Sidra Jafri. Bookmark the permalink.